Cashiers are simply the people who look after handling cash for any business. Any organization or institution, ranging from schools to restaurants that deal with cash transaction will thus require a cashier to manage the accounts. Consequently, accuracy, problem-solving and mathematical reasoning are among the various roles that a cashier performs. In some cases, they are also given the task of interacting with customers and clients and guiding them through all kinds of financial transactions. If you are looking to apply for the job of a cashier, your CV should thus highlight elements that provide proof of it. Here are some templates that you can use. You may also see the Sample Resumes. The job of a cashier is far more complicated than keeping track of financial transactions. 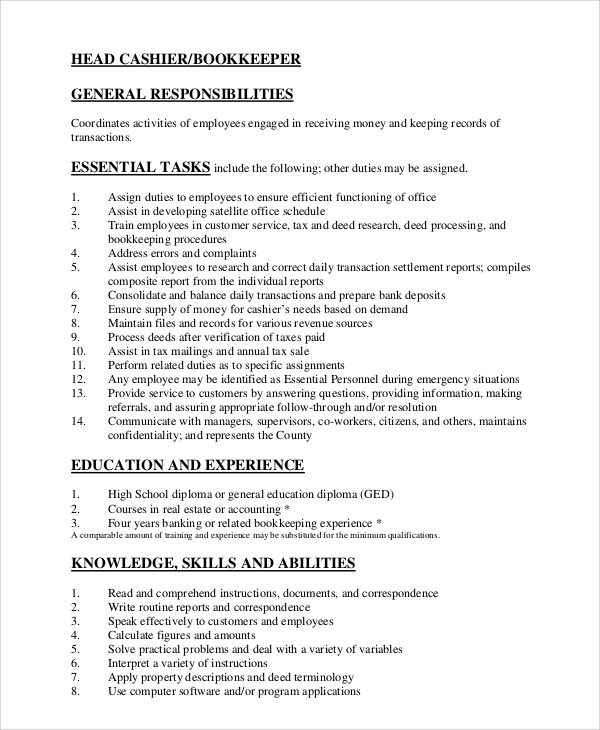 This template provides you with details of all the various roles, accountabilities, responsibilities, skills, knowledge, education and certifications a cashier is supposed to hold. Use this information to give a higher value to your resume. Looking for you first job change? 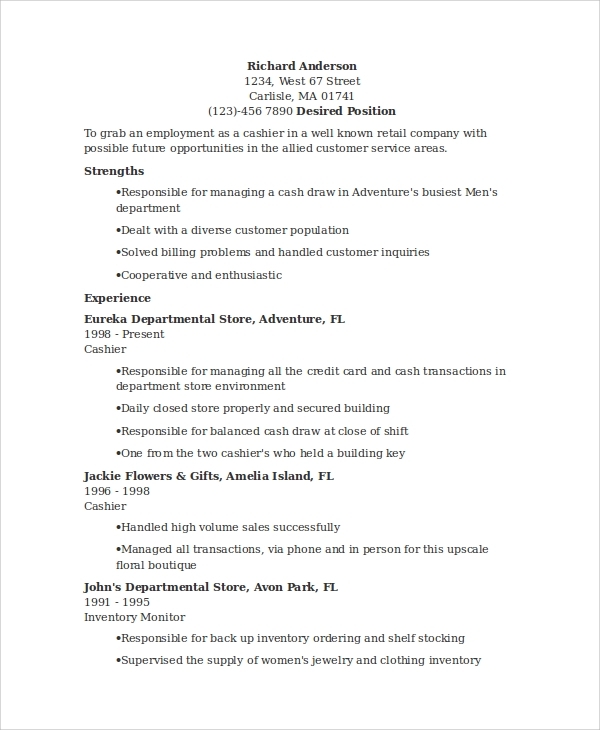 This template is perfect for candidates with the minimum amount of job experience as a cashier. The layout ensures that the details are presented both in a comprehensive and professional way. You can always edit the document to include your personal summary, work experience, qualifications, certifications and key skills. If you have been trying to create a CV/Resume that highlights the experience you holds and the responsibilities you deem yourself capable of, here’s a great way to lay it out. The resume template is simple and is also a comprehensive CV that any candidate applying for the post of a cashier can use. 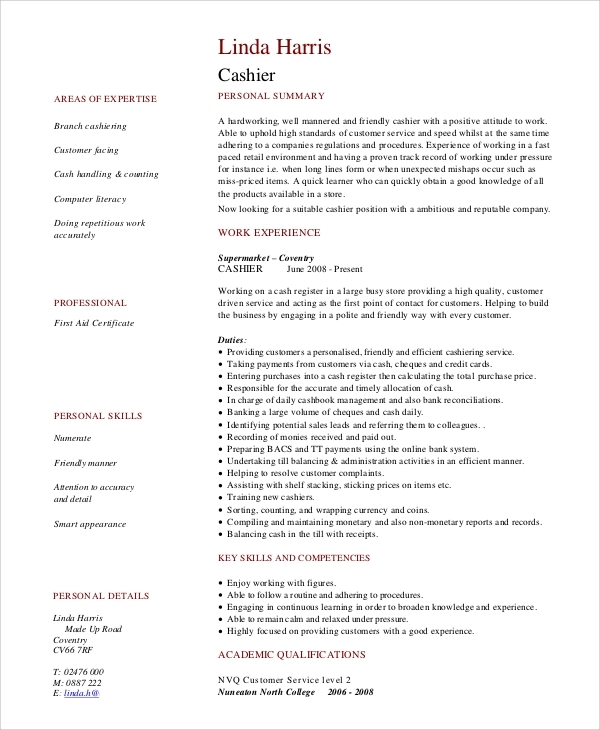 Another general resume template for cashier jobs, the resume, offers a layout for putting your details of your objectives, work experience, responsibilities held, educational details, certifications and personal goals. This should be able to impress any organization looking for a serious candidate. Most often, the roles of a cashier are clubbed with that of the responsibilities of a person at the reception desk. This attaches things like customer handling experience to the resume. If you are going to apply for such a post, especially in hospitality based organizations, this will be a great template to work with. 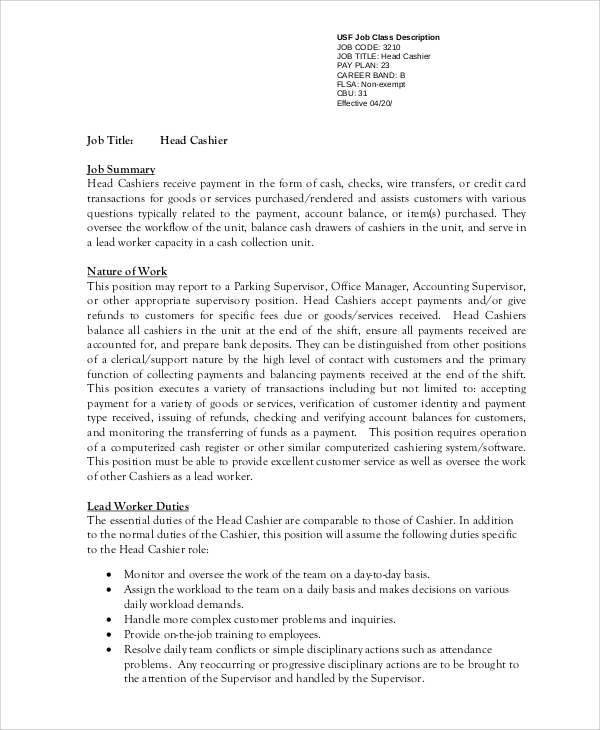 What Makes The Resume Of A Cashier Different? Cashiers are a different breed of professionals altogether. In the past days, their job was only to deal with cash, but modern workplaces have also attached people-centric roles to the description. 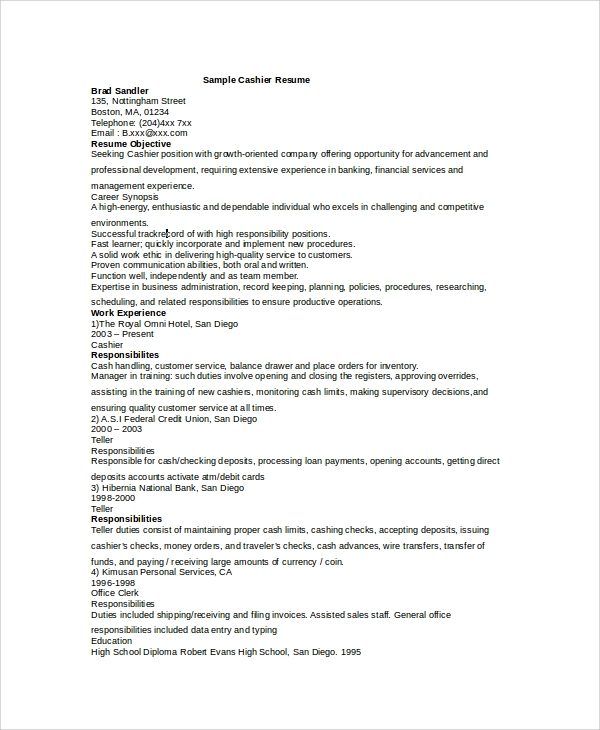 As such, the resume of a cashier should be no fuss and all information – information that the organization can trust and put the candidate in charge of their cash flow. 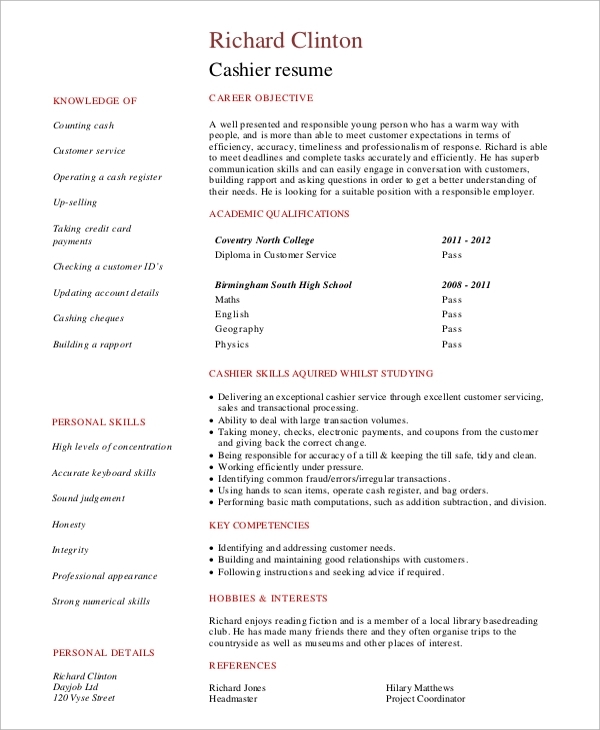 How To Write A Cashier Resume? 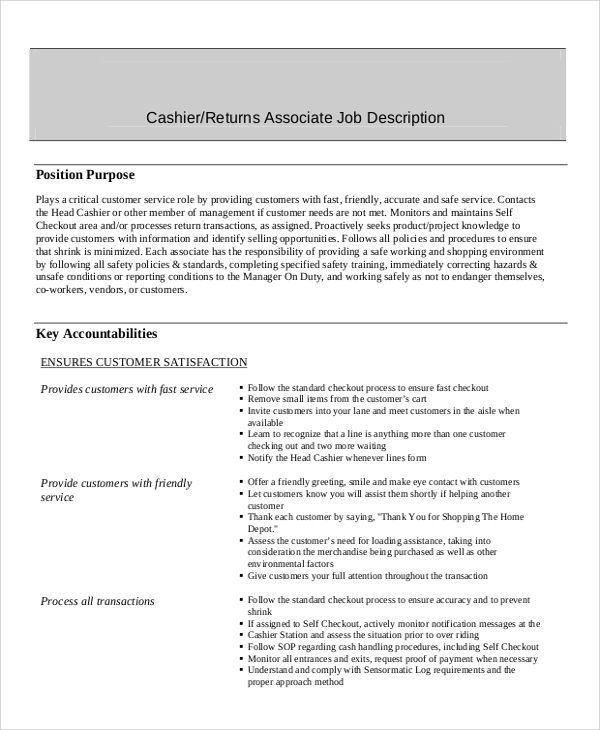 Cashier resumes are more about details than personal interests and hobbies. The interviewer is more concerned about how coolly you can handle cash and what experience you have in the field. You may also see the Sample Retail Resumes. All the above resumes are available either as a.PDF or an.MSWORD file. Easy to edit, they should help you make a mark in the first round of selections.